Go to the health check, examine the data health and click on repair objects immediately to speed up the remediation process. Otherwise you will have to wait 60 minutes (default) for the clomd timeout to expire and start rebuilding the absent witness components on the new witness host. I won’t go into this in any great detail as I already have a blog post on how to do that. The process is almost identical, with a few enhancements made to the overall process in VSAN 6.2. In a VSAN stretched cluster, where the witness and physical hosts communicate over L3, static routes will need to be added to allow the physical hosts and the witness host to communicate. 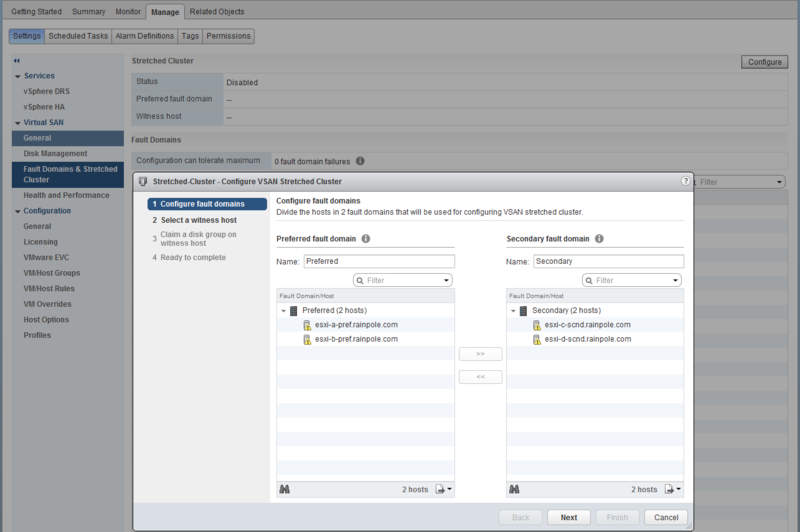 This procedure is covered in the VSAN stretched cluster guide. Not an awful lot to add here either. This step is also covered in the blog post mentioned in the previous step. However you might now see two witness in your inventory, the original and the new one. 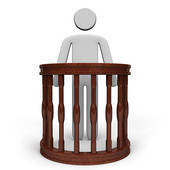 In my case the .19 witness is the newly deployed witness, and .26 is the current one due to be replaced. 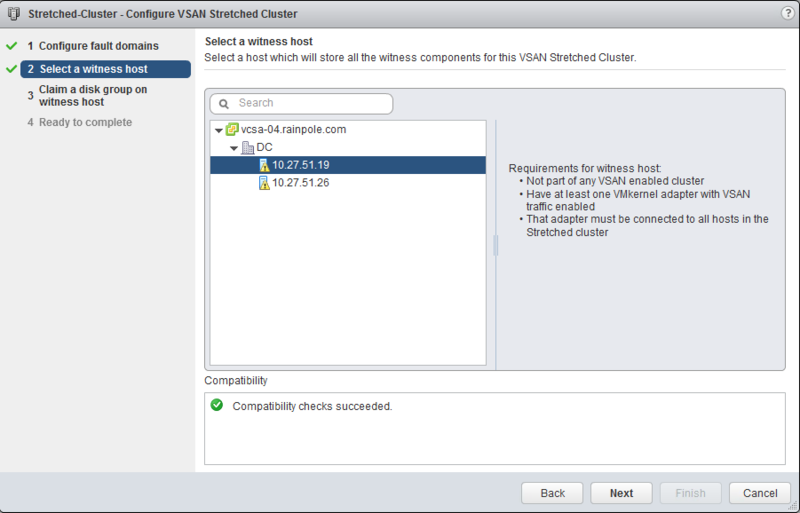 To remove the witness appliance, navigate to Cluster > Manage > Virtual SAN > Fault Domains and Stretched Cluster. Note the witness host is .26. On the right-hand side of the window, there is a “Disable” button. Click this, then click on Yes to confirm removing the witness. Now the next step is to select the new witness. This time I select the .19 witness host, and not the .26 witness host. The rest of the steps are the same as setting up the witness for the first time, such as creating a disk group, etc. When all objects show up as healthy, the replacement process can be considered complete. The best thing about this post is the Photo of the Witness 🙂 Love it!! I can only find a 6.1 applicance and even then I’m using a 6.1 appliance and I can’t seem to get rid of the pesky “host cannot communicate with all the other nodes in the vSAN enabled Cluster”. What’s more problematic is in my home-lab I have different physical switch for vMotion and iSCSI and a then a different physical switch for Management and Server/Desktop Traffic. So Your step-by-step guide works fine, right up until the end with the static routes…. What I’m seeking is how to assign a static route in the vSAN Witness Appliance to go out a vmnic that is assigned to a specific network adapter in the Witness VM that is connected to the iSCSI VMKernel Port on vSwitch2 that is on both of the two Physical hosts that can comunicate fine over the vSAN Traffic VMKernel Port. 6.2 won’t be available until vSphere 6.0u2, which should be out soon. That’s why you cannot find it. Check out the VSAN Stretched Cluster Guide (link in publications page). That’s got step by step instructions on configuring static routes between witness and hosts.